Today’s blog ties up all the loose ends and does produce a limited, but fully functional, dependency injection factory class based upon annotations. As you can imagine, to demonstrate the complete idea requires more classes than I usually associate with each blog, so you can get hold of the complete source for this example from Captain Debug’s new GitHub1 repository: git://github.com/roghughe/captaindebug.git. From the image above, you can see that the code neatly divides into several functional areas. 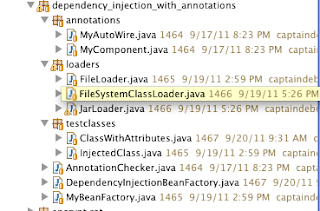 Firstly, if we’re talking about dependency injections and annotations, then we need at least two annotations to prove the point and so I’ve got: @MyComponent from part 3 plus created a new annotation: @MyAutoWire. The @MyComponent annotation is a class level annotation used to denote our components, whilst @MyAutoWire is used to annotate fields and setter methods, marking them as inject-able. I’ve applied these annotations to a couple of test classes: ClassWithAttributes and InjectedClass. The idea here is that we set up a very simple dependency injection graph using these two classes, with InjectedClass injected into ClassWithAttributes. We’ll also need to search the classpath for these test classes and to that end, I’m using the sample search code from parts one and two. The functionality hasn’t changed, but if you download the code, you’ll see that I’ve done a little refactoring, moving the code that creates a list of File objects into its own class. I’ve also removed all the main(...) method nonsense and added a couple of getInstance(...) methods. This code, like the annotation checker class AnnotationChecker, hasn’t changed enough to include in the blog. This interface has one implementation DependencyInjectionBeanFactory that, during its construction, loads and glues together the appropriate beans. For simplicity, I’ve limited the dependency injection to fields only, but you could also easily apply this to setter methods. ...which you could argue breaks the encapsulation of the object: there are good reasons for private fields and perhaps they should stay that way and perhaps you should prefer annotating setter method... but that’s another argument. 1 This is something that’s been requested before and something that I’ve been meaning to do for a while. My aim is to, from time to time, put some, but not all sample code on GitHub. 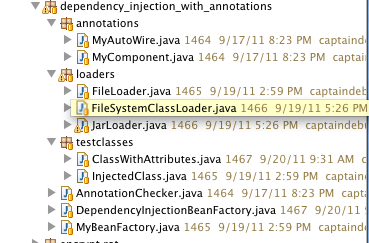 With respect to JSR-330, it appears that @MyAutoWire is equivalent to @Inject. What is @MyComponent equivalent to? Both are shamelessly pinched from Spring. @Component marks an object as a Spring object. Yes, it was obviously borrowed from Spring. I did some research and discovered that @Component is equivalent to @Named in JSR-330 (and @Autowired=@Inject). It seems that you are a good part of the way toward a JSR-330 implementation. Care to take it any further?